!! I was just being sarcastic about the constant vigilance previously. Turns out that's exactly their plan. Coming back up the street I saw another vehicle in the lane plus the first one which got a ticket. The bike cop had moved up the street. As fast as the cop could write tickets or give warnings another car would park somewhere on the street. The truck in the background was the same one that got ticketed a few minutes earlier. On parts of the northbound lane there are traffic cones. No cars were parked in the lane. Are the cones left over from the painting or were they placed as temporary bollards to prevent cars parking? So what's Buckley's plan? (Stephen Buckley, that is, the General Manager of Transportation Services who reportedly insisted that the Cycling Unit test the cycle tracks without any bollards.) Have a cop dedicated to Simcoe 24/7/365? How much would that cost for each of the streets—Richmond, Adelaide, Simcoe—that were supposed to get protected bike lanes with bollards or planters? Given that being a bike cop is actually a coveted job on the force, I'm not going to use the entry level salary. Instead I'll use an average of the constable levels which comes to $77,000. Now one cop couldn't even keep on top of the bike lane parking on a short street like Simcoe, so I'd argue that there'd need to be at least two cops each on Richmond and Adelaide. That's a total of 5 cops which comes to $385,000—give or take a bunch—per year. Or $77,000 for just Simcoe. Let's compare that large number to the cost of installing bollards on just Simcoe because it's easier for me to estimate the total number. One surface mountable plastic bollard costs ballpark $50. I don't have a clue how much the installation costs but I'm going to estimate on the really high end that each bollard costs $50 to install or replace. 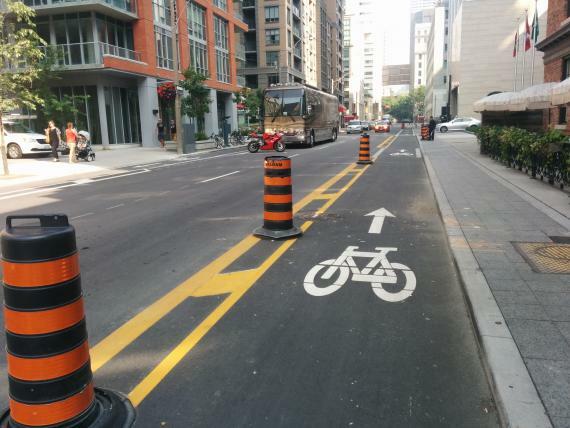 I think there could be at least two hundred bollards on Simcoe which comes to $20,000 for the initial installation. But I've heard from city staff that bollards get bent and broken and have to be replaced often. So I'll again assume on the high end that 50% of all the bollards get replaced every year, which comes to $10,000 a year. $10,000 versus $77,000 which can't even buy prevention? Penny wise, pound foolish. I would have thought only our Mayor was the master of this backwards logic but GM Buckley seems to be getting the hang of it. You've neglected to account for money made on tickets in your math. This way they get all the revenue from the tickets the cops write. I don't for one moment think this was part of their decision to go with cops instead of bollards. But wouldn't it be nice if it was. Think of the funding opportunities from the city enforcing their own laws! A single cop in front of my building on Bay Street could make money all day off cars in the diamond lane. Why don't they? Mind-boggling. Those bollards were put there after the bike lanes were finished. Too many vehicles parking in the contra-flow lane. Bollards should be placed on opposite side of the road too. @Arististhenes, @hayley True, I didn't include ticket "revenue". After all the administrative costs and the canceled or discounted tickets, how much revenue is left over? I have no idea but I bet it's not huge. I will take the liberty of saying it doesn't change much my basic argument. I'd still much rather have prevention than wait until someone parks in the bike lane, give them a ticket and then wait for who knows how long for them to actually stop blocking. @Stewart, those are technically pylons and not the permanent bollards they promised. Still better than nothing for now. I think the revenue from the parking infraction tickets is greater than you think. In fact if I'd wager that the cops certainly offset whatever their salaries are with parking tickets if it's an area with excessive infractions. That looks like the case here. It's an income stream for the city. Parking operations brings in something around 20 million for the city each year. Mind you I'm in favour of bollards or lane separation in some way but I'm just connecting the dots here. @TomSanders, perhaps it is but thus far we've both just presented conjecture so I'd be interested to see the evidence either way. It would have to be enough revenue (if we could divide it out per street) that it's greater than the savings of using bollards instead of full-time cops. But I'd be much happier (and so would the vast majority of cyclists I'll venture) to have good separation and some enforcement. How many of those illegal parking tickets are waived for commercial companies on delivery? That might explain why a vehicle with multiple tickets simply moves further down the street, parks illegally again, and then receives another ticket. I would like to know when they're going to start putting in some lanes for those of us who come in come the east end ... Simcoe street is no good to me (and several fellow co-workers who bike)- nor is the Richmond Adelaide lanes as they stop short of where I need them! this city has a LONG way to go... sighs. Parking in a bike lane is a $150 ticket. It is not necessary for too many of those to be written per hour to cover the PEOs wages. That money has to cover more than just the PEO's wages. It has to cover all the administrative costs as well as make up for the tickets that get cancelled or discounted (such as those for delivery companies). Perhaps someone can let us know how much these costs add up to per ticket written. 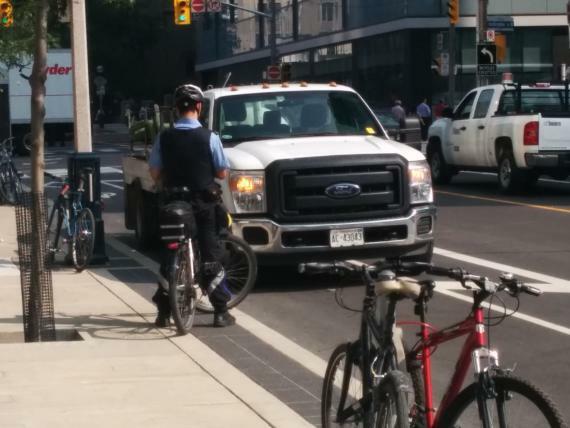 Why don't most of the parking enforcement officers, not just bike cops, use bicycles? In the States, I've seen them using segways. I now wonder just what ideas some motorists have in their minds about the legalities of parking in a bike lane. We now know that some motorists have crazy ideas abut all sorts of things pertaining to the streets so maybe they have some idea that parking in a painted bike lane is allowed. I remember on Hornby street that the previous painted bike lane was ignored by motorists all the time. It was scary sometimes too as the motor traffic speed is high. It took putting in concrete barriers and timed turning lights to solve that problem. I think you can make a case for asking the City, or planning department or whoever, just what kind of experiment is being conducted. What kind of things would make the paint not good enough? At what point is it determined to be not good enough and it's time to go to the next level (or higher) of protection? Who decides? What criteria? Is there even an experiment being conducted at all? And of course since there's an election coming up, now's the time to find out what candidates are planning to do something about this. 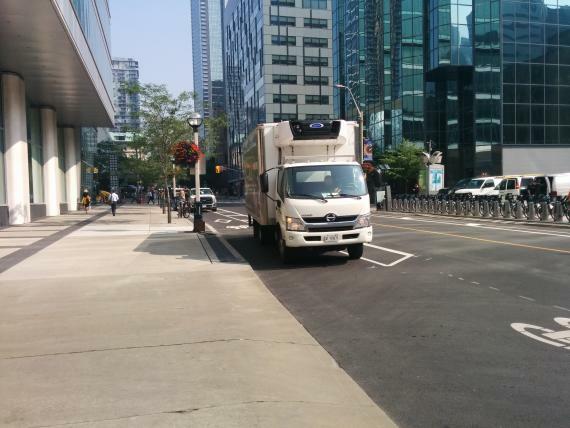 I took a walk along Simcoe Street this past Sunday (August 3) to see what compliance was like. In my first pass there were two private motor vehicles parked in the bicycle lane in a single block. On my return later in the day there were three (two cars and a motor cycle). There were cyclists using the lanes who had to go around the parked vehicles. That being said, I didn't see any parked vehicles on Adelaide (though the disappearance of the bicycle lane for a construction barrier is problematic). Experience in Toronto shows us that painted lines do not keep motor vehicles from using the bicycle lanes for their convenience.